Jim Woods, a grand officer and a member of Peace and Unity Lodge No 3966, Landmark Lodge No 7273 and Baines Lodge No 7844 is nearing his 76th year. For many years he was a member of the Provincial Care Team, based first in the centre of Liverpool and then at Huyton. Jim checks the route with his wife Pauline. Every Wednesday morning would find Jim travelling from Poulton-le-Fylde to the Liverpool and Huyton offices to handle grant claims for Grand Lodge and Provincial Grand Lodge charities. He is now the Administration Support Care Officer to the Provincial Grand Almoner and works from home. Despite extensive hip replacement surgery and suffering a debilitating stroke, Jim still gets about and visits his lodges as often as he can. Shortly after his stroke he was contacted by the Stroke Association department of ‘Life after Stroke’ who have Claire Upton as their coordinator. Claire arranged for Jim to receive physiotherapy and rehabilitation care. Claire invited Jim to be a ‘Volunteer for Life after Stroke’ and this has led to Jim becoming the chairman of the Fylde and Wyre Stroke Support Group, a local organisation with over 60 members. 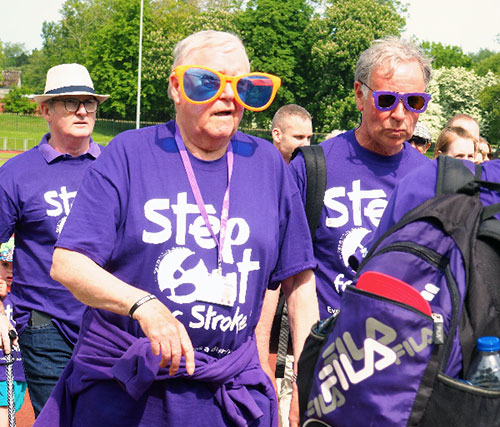 Each year the Stroke Association have ‘Step Out’ events which are sponsored walks that are held at different venues around the North West. Jim took part in one of these events two years ago and raised nearly £500. This year at Blackpool, Jim was determined to complete the one mile walk along the paths of Stanley Park for the second time. He missed last year’s event due to holiday arrangements. Jim trying to look inconspicuous! For the 11:00am start Jim arrived at the arena in Stanley Park early, being one of the first to arrive. 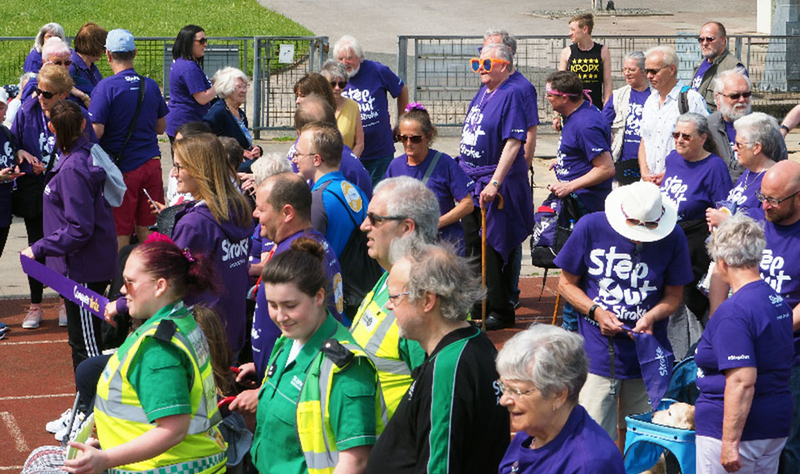 Here he waited for his fellow walkers, all of whom were resplendent in purple T-shirts with the Stroke Association logo. Jim, who was accompanied by his ever supportive wife Pauline, was no exception and they both wore their purple shirts with pride. The walk began in bright sunshine with Jim and Pauline in the middle of the group of nearly 70 participants. On his previous walk Jim had been the last to start and the last to finish. Not so on this occasion! There were several walkers on his tail, he having finished the walk in just over an hour this year. 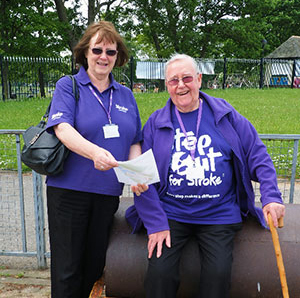 A careful eye was kept on all the participants by Life after Stroke coordinators, Claire Upton and Kay Houston. Extra support was provided by members of the local St John Ambulance Brigade. Also, many participants were accompanied by family members who lent moral support as well as a few helping hands. So far this year Jim has raised a total of £650 for his exertions but he hopes more will be coming in, as more money has been pledged. He was particularly keen to thank his many brothers in Freemasonry for their pledges of support, particularly the members of and visitors to his own lodges mentioned above. Jim (with orange sunglasses) ready for the off.